PHILADELPHIA (Embargoed until 2 p.m. ET, Sunday, June 24, 2018) – New nuclear medicine tracers could help medical researchers find a cure for Alzheimer’s and other neurodegenerative diseases. The research was presented today at the SNMMI 2018 Annual Meeting, June 23-26 in Philadelphia. The development of therapies for neurodegenerative diseases has been hampered by the lack of a reliable and sensitive method to detect disease early and to effectively monitor the performance of experimental drugs. Synapse loss is one of the earliest and most robust biomarkers for Alzheimer’s disease, and quantification of synaptic density in the central nervous system could be used to detect a variety of neurodegenerative diseases at their earliest stage, track disease progression and monitor the effect of therapy. 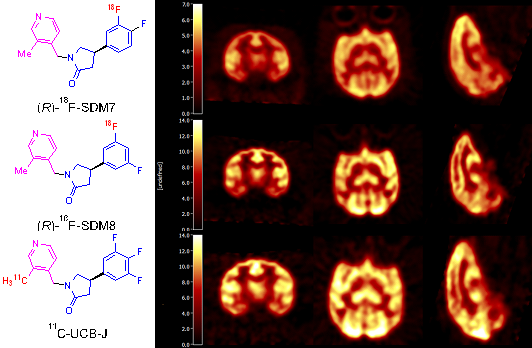 FIGURE: Chemical structures and brain PET images of the novel 18F-labeled SV2A PET tracers, 18F-SDM-7, 18F-SDM-8, and the lead tracer 11C-UCB-J in nonhuman primates. Credit: Z Cai and S Li et al., Yale University, New Haven, CT.
Abstract 69: “In vivo imaging evaluation of a novel 18F-labeled SV2A PET tracer in nonhuman primates,” Zhengxin Cai, Songye Li, Daniel Holden, Shu-fei Lin, Anupama Shirali, Paul Emery, Michael Kapinos, Jim Ropchan, Nabeel Nabulsi, Richard E. Carson and Yiyun Huang, Yale University, New Haven, CT; and Wenjie Zhang, West China Hospital, New Haven, CT. SNMMI 2018 Annual Meeting, June 23-26, 2018, Philadelphia. Abstract 68: “18F-SDM-8: A novel radiotracer for PET imaging of synaptic density,” Songye Li, Zhengxin Cai, Daniel Holden, Nabeel Nabulsi, David Labaree, Anupama Shirali, Jo-ku Teng, Richard E. Carson, Yiyun Huang, PET Center, Yale University, New Haven, CT. SNMMI 2018 Annual Meeting, June 23-26, 2018, Philadelphia.